Keeping Things Pretty | Diabetes Doesn't Own me! Just because I have to carry around medical supplies everyday, doesn’t mean that it has to look like I’m carrying around medical supplies. Taking some inspiration from the beautiful jewelry travel bags my mom has given me over the years, I took the biggest one and used it to store my meter, test strips, lancets. I’m much more excited to check my blood when I’m taking out the pretty red case instead of the standard, medical, black or grey zip case. I also wanted something cute to carry everything else I need, which as one of my friends put it, ‘is kind of intimidating’. In comes a cute little 2 sided makeup bag from Target. 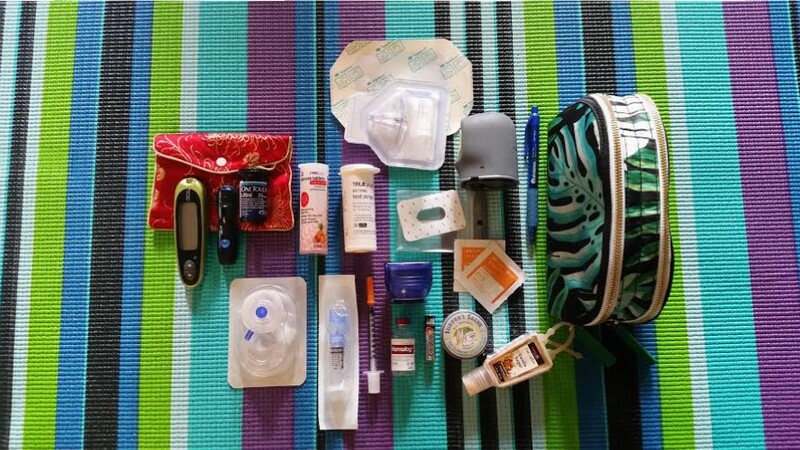 I store insulin pump supplies (infusion set, reservoir, inserter) on one side, and sensor supplies (sensor, inserter, adhesive) on the other. 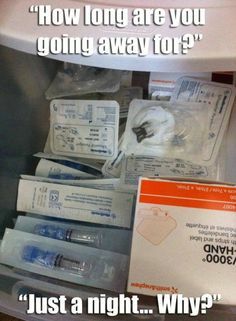 I also have a bottle of insulin, alcohol prep pads (2), an extra battery, a syringe, glucose tablets, keytones strips, large Tegaderm (2), a pen, hand sanitizer and balm. My kit is adorable, compact, has everything I need and fits nicely in almost all of my purses. I’m probably going to add a granola bar today. Now I have no excuses. I don’t ever have to experience the dread I feel when my pump runs out of insulin or battery and I’m at work, or running errands or in another state! and all my supplies are at home. Universe, bring it on!